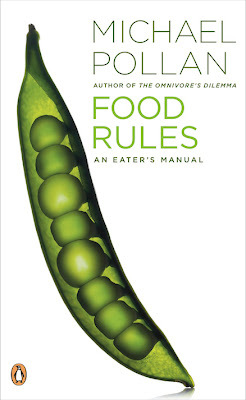 This is a (very) short, handy, easy read, full of common-sensical, practical advice on eating and food, neatly itemized into 64 rules, organized into three categories. The rules are meant for food eaters, for humans. These "rules" will however be anathema to corporations who sell "edible foodlike substances" (author's phrase). This would include corporations like Pepsico, Cola Cola, Dr Pepper, Kellog's, Burger King, Jack In The Box, Wendy's, McDonald's... the list is endless. Corporations who take food and other substances, natural and artificial, synthesized and chemical, mix the two to create something that while edible, is certainly not food as we humans have understood for centuries. Food, rather than being something found in nature that humans have used to feed themselves, has now become a substance that is manufactured by corporations, advertised to the gullible, and distributed to markets from where it is sold to people. A means to an end. The end being profits. Not health. Not well-being. Though possibly a lot of the content is derived from his earlier book(s). The short (and long) of this book is that processed food is bad for you. No question. Processed food is manufactured to be advertised, to last long, be cheap to make, expensive to sell, to be profitable, and to benefit everyone except you. Reverting to a mostly plant-based diet is good for you. A little meat is not bad. Fishes the most, birds next, cows and other four-legged animals the least. Treats are ok as long as you treat them as treats. Snacking between meals is not good. Seconds are not good. And so on. This book is a short compendium of 64 rules, broken out into three sections, "What Should I Eat" - with 21 rules, "What kind of food should I eat" - with 23 rules, and "How should I eat" - with the remainder of the remaining 22 rules. Part 1 - What Should I Eat? Avoid foods that contain high-fructose corn syrup. - "Breakfast like a king, lunch like a prince, dinner like a pauper." - Don't get your fuel from the same place your car does. Now, the book is really short. 112 pages. Even less once you take out the index, cover pages, and so on. Possibly less than 80 pages. Much of it is supposedly available in the author's earlier works (In Defense of Food: An Eater's Manifesto and The Omnivore's Dilemma: A Natural History of Four Meals ). It is priced at $11. And that is probably expensive, for the content and originality. You can buy it from Amazon.com for $4.49, or for $5.48 from Wal-Mart. These represent close to a 50% discount off the list price of the book. At $5 and change it's a bargain, I would submit, even accounting for the fact that much in it is supposedly derived. I say "supposedly" because I have not read any of Michael Pollan's earlier books, ,yet. The other thing going for the book, even despite its size and list price, is the fact that it is really very easy to refer to the book. All you do is flip to a page, any page, and there is advice, pithy and pointed. There is value in that. I would like to read the more detailed, more researched, more argued books like The Omnivore's Dilemma: A Natural History of Four Meals , or In Defense of Food: An Eater's Manifesto , or The Botany of Desire: A Plant's-Eye View of the World , but that is not to deny this book's place on your bookshelf.